Last night during the New Moon in Gemini, someone on Twitter asked me what I was doing to celebrate the New Moon, so I thought I would share the experience with my readers. With each New Moon I set up a special circle with all the elements represented, eg. North/Earth is represented with flowers, East/Air with feathers, South/Fire with a candle, West/Water with a chalice of water and God/Goddess/GreatSpirit/Divine/Father Earth/Mother Sky is represented by me standing in the center of the circle, acting as the connecting link. I then bless (with sage) and call upon my ancestors, spirits, guides, angels and elementals for the highest good of all concerned to help guide me into this Gemini lunation. I meditate with my crystals, sometimes work with my oracle cards, play my Native American flute, dream on occasion, and then write it all down. Afterwards I go counter-clockwise around the circle, blessing and thanking all the elements and finally closing the circle. Gemini teaches us how to work in the now, like finding magic in the everyday, like dreams at night, like sudden small revelations. It's the joy of the search, not the end result that matters so much. The fun part is asking questions, not so much about the answers. Gemini energy never feels too weighty or intense or heavy - think 'butterflies' all glittery and gauzey. But it was my work with the Dow Quartz Crystal that really took me to another plane of Geminian consciousness as I held one Dow Crystal in each hand during my meditation and dreaming. Of all the Quartz Crystals, the Dow manifests the most perfect geometry. Working with this Crystal can be a tremendous help in healing the heart chakra. Experiencing the Divine Essence in our hearts, even for a brief moment, lays the foundation upon which unconditional love can be built. This Crystal teaches us that the external pain of others need not be claimed as our own. The Dow Crystal assists us in identifying with and becoming perfection instead of living with pain. In my natal astrological chart Gemini rules my North Node which relates to my karmic mission (or at least part of that mission, the other part lies in the second House, the Taurus House.) My work as a soul reader is all about quickening, lightening and airing out whatever has become sodden, heavy, a dead weight. My readings bring insight of course, but also fairy blessings, sparkly and mercurial. There is healing and joy in a soul reading but the REAL WORK is always up to you! The drawing to the right is part of my Lefties Series (all drawn with my non dominant left hand.) 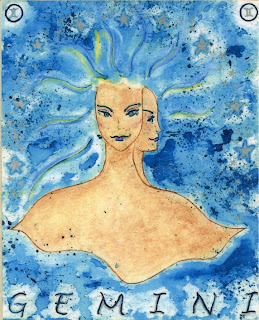 The Gemini painting at the top is from a Goddess of Astrology Series that I painted for a book of Meditations I created back in the 1990's. I also offer a New Moon Soul Reading here. To read more about Psychic Development How-To on my blog please click here and to read about Crystal Healing please click here.